You just told the exact story (well, about) that I will be telling in a couple of days about lowering the needle and testing with the filter off. Sounds a bit risky and could jeopardise the gearbox bearing if it is a bit tight. I just did mine and the BSA service sheet says 1 1/2" total top to bottom movement at the tightest point on the stand. I used a tape measure sat on the ground to get it right. Sounds about right Jim. I use measurements as a guide rather than a rule - a bit like how I view many road 'rules'. I matched my handlebar position to a picture Bill posted, and went for about 30 miles. My hands were not numb, but my lower back is a little tight and my left knee is a bit sore. I had changed from 110 octane down to 100 octane so I checked the plugs and I am a little lean- but my last little bit was 5 miles at 60 MPH or so, and thats new since the rebuild. I am going to go to a 30 pilot jet anyway, I have that screwed out only 1/4 turn. When the gearbox is warm, it is super easy to find neutral, 1st and second are harder to find. Front brakes still squeals, hoping it will quiet with some miles. I am having a complete blast with this bike. Rode down to the Beamish Trophy Trial, competed, rode home. 400+ miles including some very challenging off-road sections. Poor old bike, yet another merciless caning. Moved the A7 plunger onto the bench. She's been sitting for a month or two without the sump plug in due to excessive wet sumping. Sump plug in, fuel & oil in tanks. Started 2nd kick. Getting ready for the DGR. Got a wake to go to on the Saturday (and it's my b/day) so I'll be a bit under the weather. Picked up my new leather bike jacket today ( summer jacket ), its very nice but will have to wait 6 months for the sun to come back before I can wear it. yep ,this Summer certainly changed things didn't it, for the first time in ages I longed for a lighter jacket ,I was sweltering even late evening rides out but boy it was a nice change , so will follow your lead and buy a summer one . Picked up the head from the Repairers - new guides and valves. Got the rings from SRM last week. Will put it all together next week. Swapped car for A10 to drive back to work after lunch. Everything great. Had to leave work early and in a rush to beat a rain storm. I was hittin' it pretty hard when, about half mile from home, the shift lever goes limp and I can only get first and second. Seemed obvious it was a broken stop plate return spring (yes, I had to look up the right name). Got home, pulled the cover and, no surprise, I guessed it right. (It wasn't really subtle.) I have three extra covers in mixed levels of bad condition around and none of them with a spring. So, it's into my spare gearbox I'll go to be sure I'm together in time for DGR. "What's DGR?" So glad you asked. 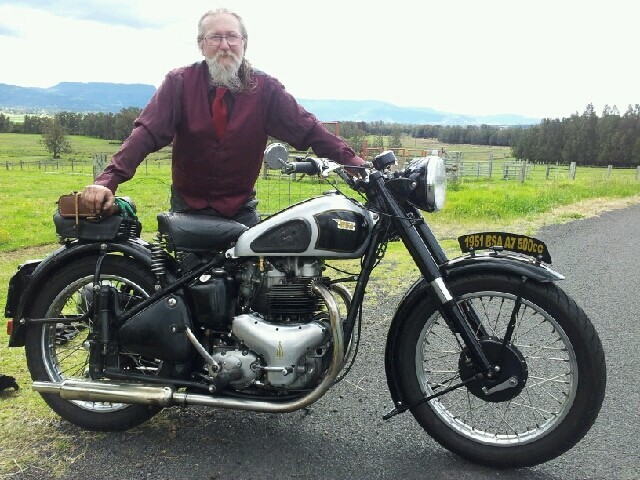 Go to Gentlemansride.com right now and sign up for your local ride.Then, search teams for "forum" and join our team. Do this right now. Do not delay. The ride in your neighborhood (and all neighborhoods) is on 9/30. I guarantee you will have a good time or I will buy you two pints at Quigley's when you come to visit. Hell, I'll buy it anyway, because you WILL have a good time. Having fixed my sons car and taking it for a retest I'm on the next task: I'm making a sandpit-come-ship for my granddaughter whose birthday is on Saturday. Oh dear Betsy Beezer, I don't know if you are going to be ready for the DGR! Please note, if dappering-up concerns you, you really do not need to worry about what you wear on the ride; your normal riding kit is fine. After checking and adjusting valve clearances yesterday , quick road test to check all ok, now spend rest of day putting swing arm and rebuilt wheels back in Rocket3. Rained off work today so hoping to find time to check over A10 which had to work hard last Sun. Need to be fit for the DGR, links above, looking forward to that. Great charity and a laugh a minute, just hope it is dry. Come on anyone who is considering it, you'll be glad you did.